Larry and I are vacationing in New York City. We’re visiting friends and family, and taking in the sights, sounds, and sensations of the local environment. While wandering around the “City” and our old hood in Rockland County, NY (about twenty miles north), I’ve been thinking about this post–writing it for the LadyKillers Blog. It wasn’t until today, when we visited the Metropolitan Museum of Art (the Met), and our drive back into our own past, that I realized history constantly surrounds us–no matter where we live. Our homelands are rich with historical facts. There are graveyards hidden in the bushes surrounding our towns. Yep, Punk, a culture that involved music, dress, and odd forms of expression. Then we rode through Nyack, NY and spotted the Edward Hopper House being renovated to keep its history and artwork alive. We finally reached our old Hudson River homestead next door to Nyack, a village named Grandview, its shoreline ravaged by Hurricane Sandy. Both Thomas Berger (Neighbors and LIttle Big Man) and Toni Morrison (Beloved) live in this small village–history makers in the literary world. By the time we left the old hood and I contemplated this post, it had grown feet of its own. Walking down memory lane at the Met, then in my old neighborhood, I realized history will always be present. We just have to look for it. And if we’re lucky enough to care about it, we could share the find and continue its unique story. This entry was posted in Uncategorized on May 25, 2013 by trow125. The Interactive Way to Write Your Next Book: Crowdsourcing! Recently, I was at a meeting with my new publisher and several of the authors from Harper Davis. We discussed “Branding,” and my need to redo the way I brand myself as well as my blog, website, and name. I tend to use Pat Morin, and not the Patricia L. Morin signed on my books and short stories. When discussing the use of name, one of the marketing people suggested I crowdsource an opinion of which of the names I should use. I had never heard of it. Several of the authors had explained that authors are now using crowdsourcing to write their novels. With the help of their fans, their new stories are being created. Wow! 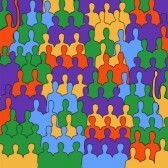 First let me define crowdsourcing (and if some/all of you know, please forgive the repetition). Crowdsourcing is, according to the Merriam-Webster Dictionary, the practice of obtaining needed services, ideas, or content by soliciting contributions from a large group of people, and especially from an online community, rather than from traditional employees or suppliers. The general concept is to combine the efforts of crowds of volunteers where each one could contribute a small portion, which adds into a relatively large or significant result. Crowdsourcing is different from an ordinary outsourcing since it is a task or problem that is outsourced to an undefined public rather than to a specific, named group. Although the word “crowdsourcing” was coined in 2006, it can apply to a wide range of activities.Crowdsourcing can apply to specific requests, such as crowdvoting, crowdfunding, a broad-based competition, and a general search for answers, solutions, or a missing person. There is even a new platform for writers all over the world launched by CrowdSource, LLC. The new portal, called Write.com, aims to recruit new writers to enrich Amazon’s Mechanical Turk crowdsourcing marketplace. Authors are able, through this new format, to change endings and rewrite books, as was discussed on LadyKillers Blog before. But now, we can include our fan base to help create the story from the start. Out with the outline, out with the plotantsers, out with the 1,2,3. In with the new group interactive process: crowdsourcing! This entry was posted in Uncategorized on May 10, 2013 by trow125.